I am not familiar with how to determine the prying force. 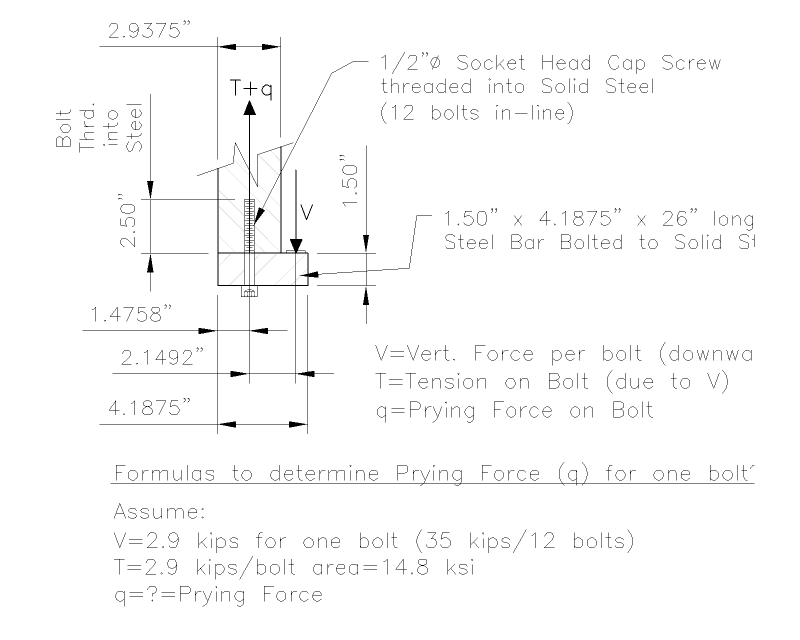 Can someone please show me how to calculate the prying force on the bolt in the attached sketch. Per the attached drawing, there is no way to figure out the prying force as the drawing shows no anchoring of the bracket. Depending on what you are looking for, this is probably an elasticity problem. Before going into an analysis, you should fully understand the elasticity of a bolted connection. I say that because I assume that you want to know how much you can safely load the bracket and bolt together. With a properly-sized and torqued bolt, the load that you are applying should not allow separation of the bracket from the clamped member. If your aim is to determine the total stress in the bolt, you also need to determine deflection of the bottom bracket and calculate the strain and resultant stress due to that deflection, which can potentially result in a situation where a larger bolt experiences higher stress than a smaller one. Note that this is why connecting rod fasteners in racing engines counterintuitively owe a longer life to having a smaller diameter. What is the bolt size? What is the material being clamped? What is the thickness of the clamped member? in your case its important to determine the preload and the stress (pressure) between the bolted parts. This is IMO the primary mechanism for reacting the offset moment, ie the offset moment is reacted by a pressure distribution (linearly varying) between the bolted parts. Now, of course, the bolted connection cannot handle tension loads (which is required by the bending field). Thus the role of preload … to create an initial compression between the faces, which is then relieved by the offset moment pressures until the joint starts to gap. When the joint starts to gap, now the bolt starts to become the tension loadpath for the offset moment. Now the offset moment is reaction by a couple between the bolt (tension, in addition to the preload)) and joint faces (a triangular compression of the far side of the bolt). Very quickly the load will be excessive, you can see how small the couple arm is (between the bolt CL and 2/3rds to the edge) compared to the offset distance. If your ignore preload and assume there is just enough tension to make initial contact the free body can be solved as noted above. But if you do not ignore preload the problem becomes more complex (as noted above) and the proportional stiffness of the plates and bolt would need to be considered. F bolt= Fi + .11 Fapplied. So when you load a bracket with a preloaded bolt (90% of TS) the bolt only sees about 10% of that load untill the parts seperate. As the parts are like a compression spring takening most of the applied load. This is not so intuitively obvious and not often considered when doing bolt calcs. You can google it to get some views that explain this better. Thank you all of you for the information. Not only was it all informative, but it gave me pause to think if maybe we can do something better with this bracket. If we change this around - I may be back again to ask for help on bolt prying. My first cut would be the force applied to the lone (?) bolt is 3.44 x P.
- Embedment or deformation of the extreme left had corner of the bracket and the component on the other side of the faying surface. - As others said, clamping/preload less than the applied load subjecting the bolt to fatigue concerns if the load is varying overtime. -Convexity of the faying surfaces so the bolt is subjected to bending. Even a few 0.001s inch is a big deal. - Twisting of the bracket around the bolt's center-line if the load has a Z component, and the bolt preload is not sufficient. - The design of the entire bracket in regards acceptable deflection, and stress in that corner. Is this an existing design that consistently provides years of satisfactory service in its natural habitat? If however it exists only digitally, there is a LOT more about about operating conditions that need to be identified and understood before releasing the drawing for manufacturing. Since I got all the good advice everyone sent - I decided to go in a different direction. Please see the attached. Can anyone tell me how to calculate the prying force for this model? to make your sketch a FBD you need to add the reaction for q, a distributed force on the far side of the load, so that the offset moment V*2.1492 is reacted by q*2/3*1.4758 … rapidly q becomes unreasonable. so then you apply preload to press the pieces together. The preload creates a pressure between the two pieces, that the offset moment relaxes with an opposite pressure field (linearly varying, like a bending stress). yes? distributing the load over all 12 bolts ? is that fair ? are some bolts nearer (or further) from the load ?? As a start I'd sum the moments about the extreme left end of the 1.5" thick steel bar. Where are you getting the 2-15/16" thick bar/plate? If you are machining plate, why not machine the foot and forget about the fasteners?